Researchers from A*STAR's Bioinformatics Institute (BII) have developed the first mobile application for Android phones that analyses ab1 DNA sequencing files, which enables science professionals and amateur enthusiasts to engage in scientific analysis on the go, from the convenience of their mobile phones. DNA sequencing is a commonly used technique which has advanced many areas of biological research, from the understanding of genetic information to the causes and treatment of human diseases. However, analysis of DNA sequencing files used to be carried out only on computers. This frustrated Dr Samuel KE Gan, molecular cell biologist and team leader of Antibody & Product Development (APD) Laboratory, when he wanted to work when travelling. He presented the challenge to his computer science research officer Mr Nguyen Phi Vu, to find a better way to read data on the move. What resulted was the "DNAApp", developed in just three months, which allowed him to read and analyse DNA sequencing files on his mobile phone. Dr Gan's team published the app freely on Google Play store and Apple app store for scientists worldwide so that they too can improve their efficiency and productivity. Since its launch in early April, "DNAApp" has been downloaded more than 300 times by users from more than 11 different countries. "DNAApp" enables the visualisation and analysis of DNA sequencing files simply with the use of any iOS or Android mobile device. The application lets users assess the quality of DNA sequences and carries out commonly used functions of DNA sequencing analysis, such as reverse complementation, translation, and the ability to search for specific sequences. The latter function is important for researchers who want to locate specific segments in their sequences to identify regions of biological relevance. Also available for the iOS platform, this native application is faster and more efficient, tapping on the convenience of mobile devices to raise productivity in the lab. The "DNAApp" can work without internet access, and is designed to adapt to the smaller sizes and sensitivity of touch-screen devices. "DNAApp" has features that aid analysis such as the ability to search, swipe or "jump to" a specific section of a sequence and the incorporation of fast and end-scrolling icons. These allow the application to complement existing web-based bioinformatics tools for deeper analysis. "We are excited to see that 'DNAApp' has proven to be a useful tool for the busy scientist. As the use of mobile devices and their applications become increasingly widespread, we hope to continue to be at the forefront of technology – creating new bioinformatics tools for the advancement of scientific knowledge and making science accessible. ", said Dr Gan. Besides the research on antibodies and viral mutations, the laboratory plans to continue developing mobile applications that aid analysis in molecular and microbiology. Like the "DNAApp", these applications will raise productivity in the laboratories and have the added potential to be used as educational tools. Dr Frank Eisenhaber, Executive Director at BII, said "Thanks to the initiative of Dr. Samuel Gan, the new DNAApp software developed for smart-phones adds an exciting new dimension in the DNA sequence analysis software field. 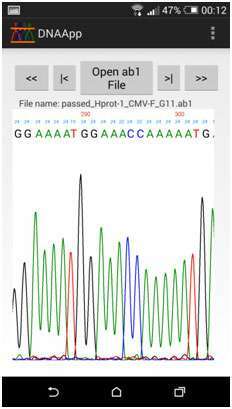 For the first time, a mobile phone application is productive for certain aspects of sequencing data studies. At BII, we will continue to develop creative ideas for useful and efficient tools and techniques in computational biology for applications in the life science field." More information: Two versions of DNAApp were created – for the Android and IOS platforms.